U.S. interwar intervention existed around the globe. In Latin America, U.S. exercised power in the Dominican Republic (1916-1924), Cuba (1917-1933), Guatemala (1920), Honduras (1919, 1924, 1925), Panama (1918- 1920, 1925), Mexico (1918-19191), El Salvador (1932), and Haiti (1915-1934). In Europe, the U.S. intervened in Russia (1918-1922), Yugoslavia (1919), and Turkey (1922). In Asia, U.S. foreign policy with China included intervention between 1922-1934, and in the Philippines from 1898 -1946. Whether defined as militaristic, political, economic, or cultural, U.S. intervention was the norm, not the exception, in the 1920’s and 1930’s. Despite these events, the narrative of U.S. Isolationism persists in high school textbooks and curriculum standards including the AP and IB programs. How is isolationism explained? Is it a valid claim? What are the limits of the isolation/intervention duality? To what extent can a global power be isolationist? What are the implied goals of a national narrative promoting isolationism? 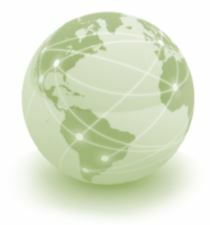 Supplemental Powerpoint Presentation: The Myth of Isolationism (click title to download powerpoint slides) This link takes you to TES resources. Download slides there. It has been used in a high school US History class. William Appleman Williams, The Legend of Isolationism in the 1920’s, Science and Society Winter (1954). This video is a compilation of two segments from the John Pilger documentary, Nicaragua: A Nation’s Right to Survive. It concentrates on Nicaragua up to the Sandinista Revolution, but also provides a chronicle of U.S. interventions in Latin America (1983). TIME Magazine: Finding the King’s Fortune! California Drill #7 Finds Oil in Saudi Arabia (2003). 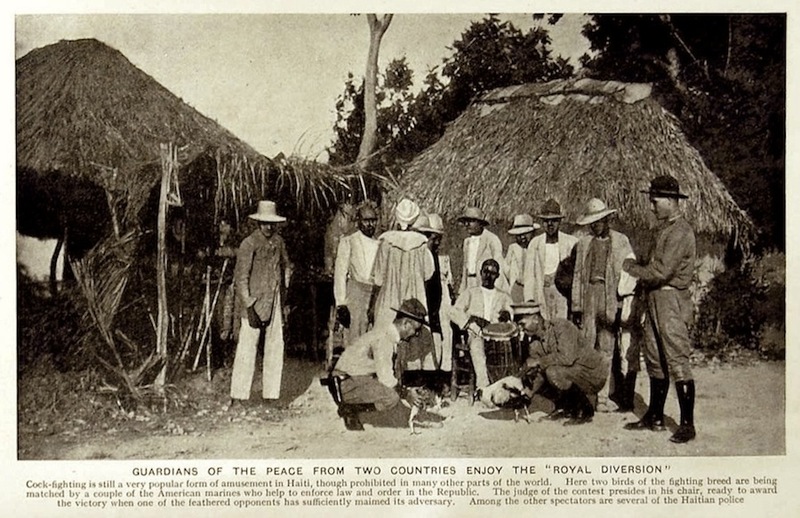 Mary Renda, Book Review by Kate Ramsey of Taking Haiti: Military Occupation & Culture of U.S. Imperialism 1915-1940 (2006). Dennis Merrill Publication, Book Review by Liza Keanuenueokalani Williams of Negotiating Paradise: U.S. Tourism and Empire in Twentieth Century Latin America, (2009). Bear F. Braumoeller, The Myth of American Isolationism, Foreign Policy Analysis (2010). Hilde Restad, U.S Foreign Policy Traditions since 1776 (2010). Photo – A U.S. Marine inspecting a troop of Haitian soldiers. Credit U.S. Marine Corps/National Geographic Society, via Corbis (1920). Soviet appeal to Washington D.C. for Famine Relief (1921). Treaty involving the United of States of America, Belgium, the British Empire, China, France, Italy, Japan, the Netherlands, and Portugal. Signed in Washington D.C. (1922). 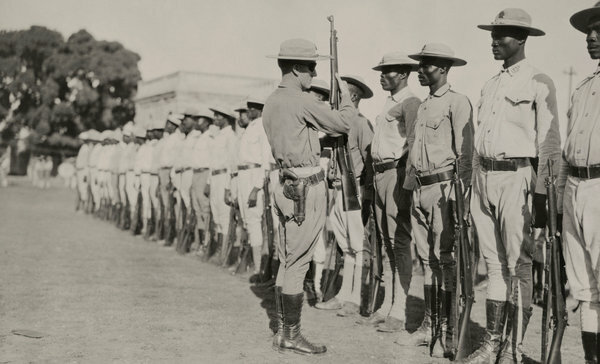 Photo – US Marines in Haiti attempt to win heart and minds, in a photo from John Alexander Hammerton’s Peoples Of All Nations: Their Life Today And Story Of Their Past (1922). Cartoon – Tacna-Arica arbitration agreement, Chile-Peru. The US attempted to facilitate the treaty (1922). LOC info is here. American Relief Administration film, selected clips “America’s Gift to Famine Stricken Russia,” (1923). Philippines Request Independence The Register, originally the South Australian Gazette and Colonial Register, South Australian newspaper. (1923). Augusto Cesar Sandino, An Open Letter to Presidents Hoover (1926). Women’s International League for Peace and Freedom, Conclusions and Recommendations by the Committee of Six Disinterested Americans (1926). Speech – President Calvin Coolidge addresses the the Pan American Conference at Havana, Cuba (1928). USMC Major General Smedley D. Butler, War is a Racket (1935). 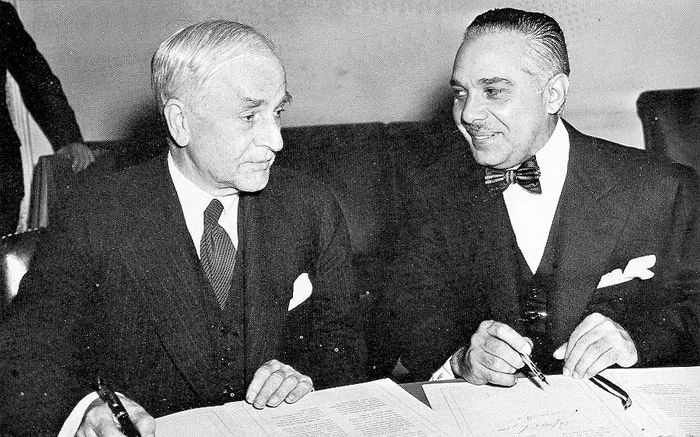 U.S. Secretary of State Cordell Hull and Rafael Trujillo, dictator of the Dominican Republic, signing the Hull-Trujillo Treaty (1940).